Wealthy donors have gathered in the Metropolitan Museum of Art's glorious Temple of Dendur to celebrate a controversial new exhibit. An uneasy mix of scholarship, showbiz, and aggressive marketing, 'A Modern Bestiary' has raised fierce opposition from some of New York's museum elite. Assistant D.A. Alex Cooper observes the developing tensions with bemused interest until Met director Pierre Thibodaux pulls her aside. A twelfth dynasty mummified princess, enclosed for eternity in a huge stone sarcophagus, is about to take a long voyage to Cairo as part of a routine museum exchange. But Cleopatra is missing, and in her place is the not-so-mummified body of a woman many centuries younger than her royal predecessor. Alex must explore behind the scenes at the elegant but severe Metropolitan, travel uptown to the remote setting of the Cloisters, and on to the massive array of beasts and bones at the Museum of Natural History. Somewhere, deep within the bowels of one of these great cultural centers, a killer may wait. 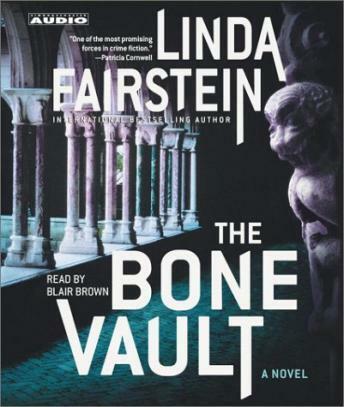 Atmospheric, chilling, and rich with procedural authenticity, The Bone Vault is a tour de force from one of crime writing's brightest stars. A LITTLE PREDICTABLE BUT STILL A GOOD READ. I LOVE MS FAIRSTEINS CHARACTERS AND HOW THEY DEAL WITH EACH OTHER FROM BOOK TO BOOK. I found this hard to listen to, slow and boring. I kept hoping for some sort of action, but I was disappointed. I enjoyed this book. It was the first audio book that I tried and I found myself disappointed when the story ended. I wanted it to go on!!! I loved the story and the plot, very exciting!! !